Get comfy. There are tall tales to be told. Bring the s'mores fixings out to the fire pit and coach the kids on the finer points of chocolate/graham/marshmallow perfection. Call your spot on the sofa before someone else claims it for movie night. Go all out with pancakes, sausage - the works - before heading for the slopes. It's a little tricky with gloves, but you'll definitely want to post some shots of the views. Admire the gorgeous scenery on the 6 minute walk to Steamboat Ski Resort. There are 2 outdoor hot tubs at the resort perfect for relaxing at the end of a long day. Emerald Mountain Trail and Spring Creek Trail are less than 15 minutes away by car. Rollingstone Ranch is a 4 minute drive – just toss your clubs in the car and go. 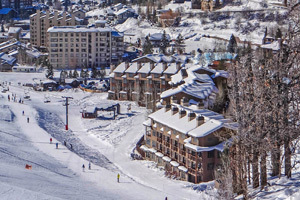 Located just steps from the Steamboat gondola right at the base, the aptly named Dulany at the Gondola is a convenient ski-in/walk out resort (bonus points for ski storage!). Elevators keep you from being completely wiped out by going up and down the stairs for forgotten goggles or gloves before you even get outside. And the concierge will be happy to assist with lift tickets and the all-important dinner reservations for those nights you’d rather leave the cooking to the pros. The resort is just fifty yards from the ski school, so toss the kids’ gear across your shoulder as they take off running toward their instructors. Once everyone’s situated, head for the gondola and map out your plan on the way up. Reclaim your little ones mid-afternoon, hit a few runs together, then make your way back to change for the newly remodeled hot tubs. Admire the spectacular mountain views while you vote on favorite runs and best “top secret” tree-skiing routes. The resort offers a private guest shuttle with service into town. Head to Lincoln Avenue for dining and shopping. A stop at the throwback Lyon’s Corner Drug Store is a can’t-miss. Milkshakes, sundaes and banana splits are a hit with both the kids and the grown-ups. Treat yourself with a massage, mani-pedi or facial at the Spa Salon. Or be a hero and surprise the kids with a stop at Rocky Mountain Chocolate Factory. Sample the fudge, chocolate-dipped pretzels and chocolate-covered marshmallows. Or see who’s willing to take on The Monster Apple – a Granny Smith apple dipped in caramel, rolled in pecans and covered in chocolate. (Offer assistance when they give up a fourth of the way into it.) Summer opens up all kinds of additional possibilities, from hiking and biking, to horseback riding. Itching to play golf? Book a tee time at Rollingstone Ranch. - There is no front desk at the property. To check-in, guests must contact the property using information on the booking confirmation to let management know about their arrival and a management representative will meet guests at the property and hand them the keys.